Avenue Mosaic is proud to announce another new glass mosaic, the Amphora collection. 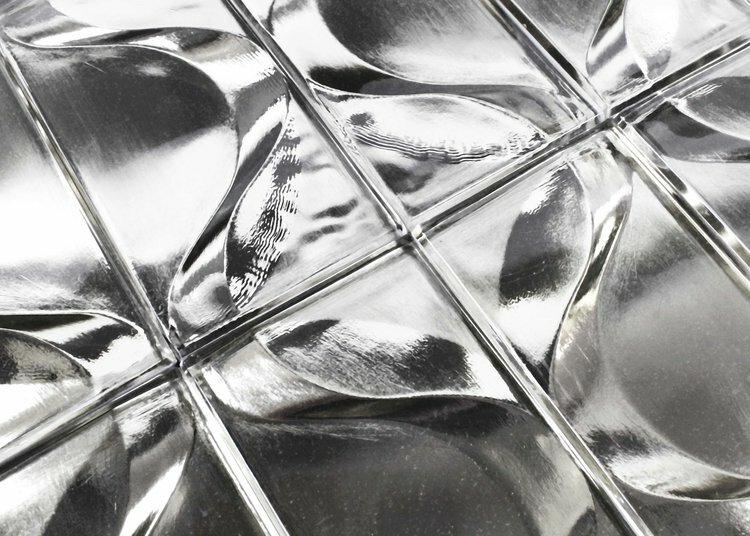 A gorgeous, electroplated glass mosaic, with a stunning metallic finish. Amphora’s thoughtfully crafted design gives the illusion of three-dimensional shapes and can also be arranged in an assortment of unique patterns. Amphora’s gorgeous, metallic surface glows when touched by the morning or evening light. Amphora is cast glass and electro-plated backing, 8mm deep, with a smooth surface. Can be installed in any indoor wall environment; not tested for pools or steam rooms. For more information about this collection or other Avenue Mosaic products, please visit Avenue Mosaic. Avenue Mosaic entered the home furnishings industry in January 2010. Founder and Creative Director Michael R Golden brought a fresh approach to mosaic design, carefully analyzing global color and fashion trends before adding his own unique sense of style to create products specifically for the US market. Many of the original Avenue Mosaic offerings quickly became industry standards and continue to be today. Avenue Mosaic brings distinctive, original mosaic designs to the North American and global hard surfaces market. We search the world for manufacturers of glass, stone, metal and wood, creating affordable, artisanal products. Our partnerships produce mosaics that reflect the highest quality, skilled design and craftsmanship, and accessible value.